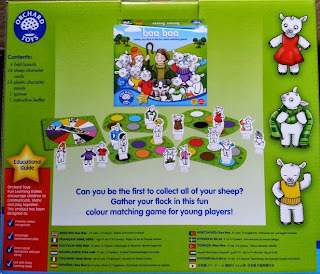 As with all Orchard Toys games and puzzles this is designed and manufactured in the UK from strong 100% recycled board. It has really bright colours, modern pictures and chunky pieces that don't bend or come apart during even quite boisterous play. It is built to be played with, and built to last. The game is really simple. You have a card with 6 differently coloured spots, a spinner and a whole flock of sheep wearing various clothes. 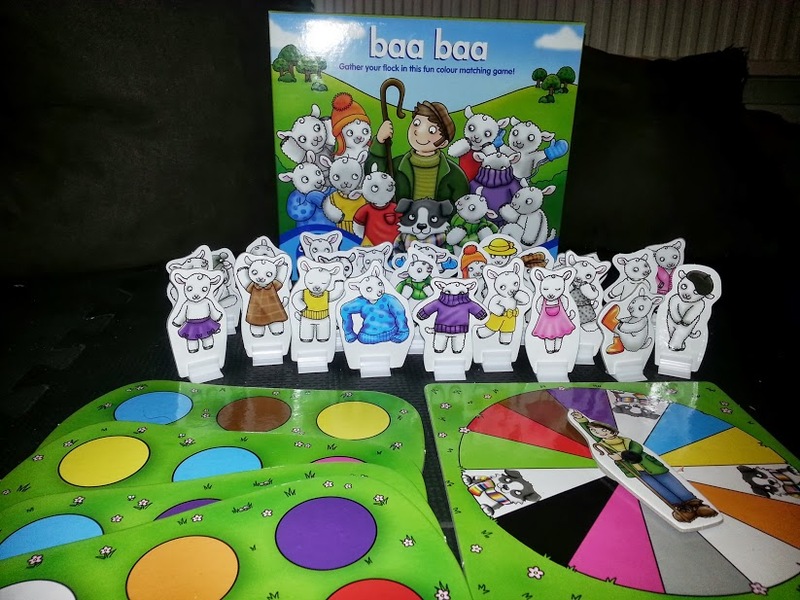 Spin the spinner and if one of your colours is shown then you take a sheep wearing an item of clothing in that colour. 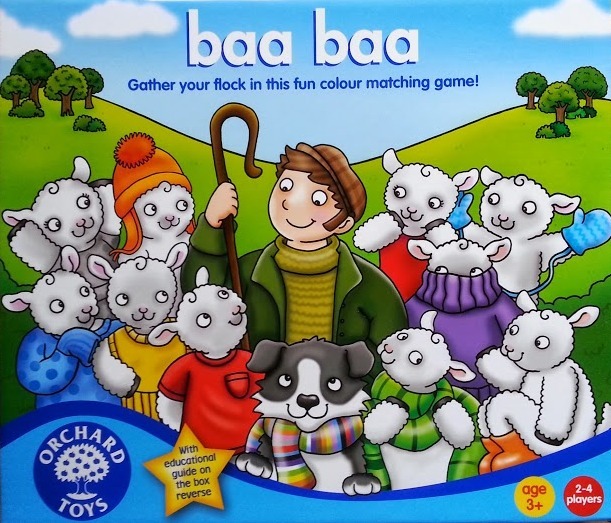 Stand a sheep on all six spots first and you are the winner! My 3 year old thinks it's really excellent and he has instantly picked up on grey and purple, which are both colours that he wasn't confident with before. My 4 year old definitely struggles with this game at times because he is colour-blind, so for him at least a game such as Orchard Toys Pirate Shapes is better, as it's not only about colour, but each part also has other visual clues as to where it should locate. 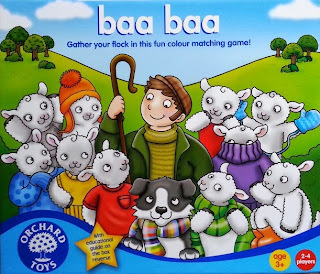 I think the age range is a little out, I can't really imagine older children playing this game without younger siblings as it is very simplistic, and I also think that the lower recommended age is purely because of small parts, in my opinion most 2 year olds would also be able to play this game very competently and get a lot of enjoyment from it - you'd just have to watch they didn't eat it instead! We were given this game for the purposes of this review, but the views expressed are ours. 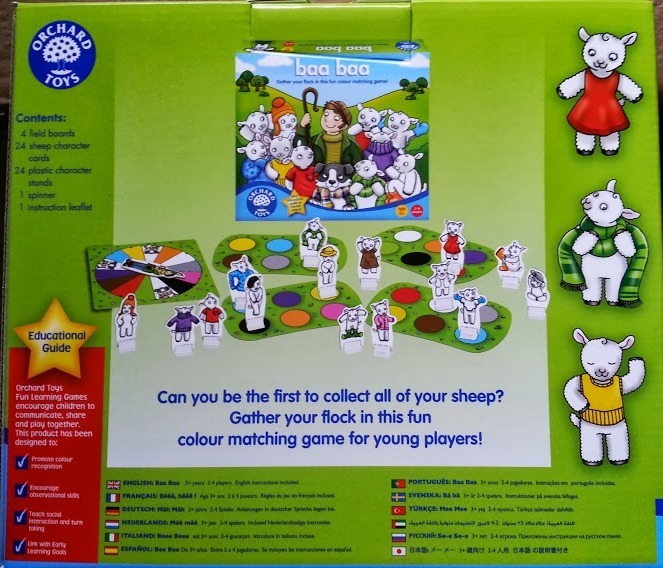 Looks great, I love the little dressed up sheep. I can imagine colour blindness is something of a hindrance though! Great review! Couldn't agree with you more either! Looks great as orchard toys always do!